I saw the 1931 quote on Facebook and having lived in the period of the 30’s I feel I am obligated to comment. The Dr. Andrea Rogers, who wrote the words below in 1931, might have been one of Herbert Hover’s advisers. We all know how that worked. It reflects how the United States handled the Great Depression up until Franklin Delano Roosevelt took office in 1933. At the time Dr. Rogers wrote those words the government of this country was in danger. Those were extraordinary times. The nation could have gone communist or autocratic per the German model. FDR did what had to be done to hold the nation and its democratic traditions together. If he had not done so it could have been the end of our nation as we and Dr. Rogers knew it. Yes people were paid to move dirt from one pile to another pile for a dollar a day and they called it work but for the most part was done to provide assistance to maintain minimal living conditions for those who needed it. As Dr. Rogers points out in his paragraph, the government has to get its money from those that have it in order to give to those who desperately need it. It is called the distribution of wealth. 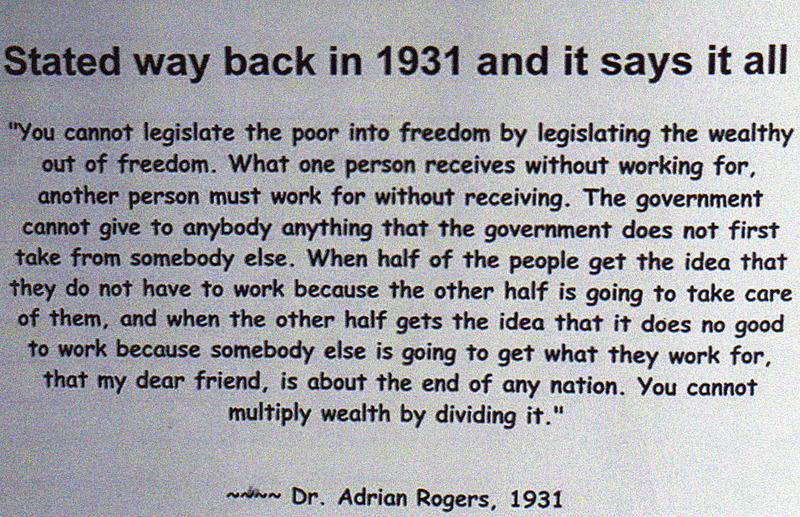 While Dr. Rogers postulates’ that distributing of wealth from the rich citizens to poorer citizens will destroy any nation that practices such a policy, it can be argued that such a policy during the Great Depression saved the nation. The distribution of wealth in the United States in the 1920’s was skewed heavily to the wealthy. Only recently has it approached similar levels. Is this a problem? If, for example, one individual has all of the nation’s wealth, most people would consider that a problem and the nation’s economy could not function. If one percent of the nation has 99% of the wealth, most people would also consider that to be a problem. Our economic system will break down somewhere when too much wealth is concentrated in too few hands. Sharing the wealth in an intelligent way can aid the truly needy and make the economy and lives of the nation’s people better. This doesn’t mean that wealth should be shared equally but a nation with the means to do it should not let its citizens go hungry, sleep under bridges, go without health care or be uneducated. It is the charitable thing to do and it will bolster the nations own selfish needs.